In The Value and Momentum Trader, Grant Henning presents a comprehensive approach to stock trading, which centers around Excel-based research methods he has developed. In this book, Henning presents the trading tools he has used to become a successful trader, and discusses some of the greatest challenges facing active market participants. This reliable resource presents both winning trading systems and all the skills necessary to perform as a trader as market conditions change. It also demonstrates how you can turn the successes and failures of any trading system into an interactive feedback loop to discover one's true trading skills. Dr. Henning has proven to be a trusted author with other academic publications in the areas of measurement and statistics. 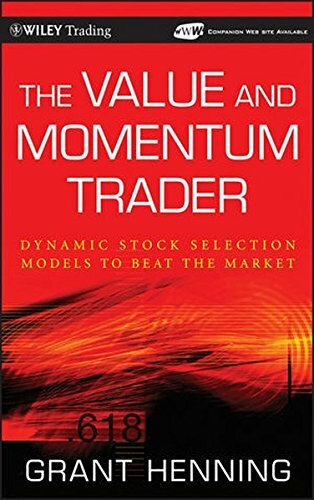 The Value and Momentum Trader is an essential guide to trading today's dynamic markets. If you have any questions about this product by Grant Henning, contact us by completing and submitting the form below. If you are looking for a specif part number, please include it with your message.